My daughter recently sent me the above pin she found on Pinterest as it reminded her of something I used to tell her. When she was in middle school, she was afraid she was a horrible person because she had mean thoughts about others. 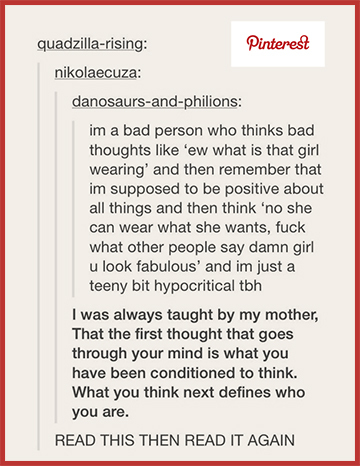 I would tell her you can’t always help the first thought that comes to your mind “but you are responsible for your second thought and your first word.” I think I like the above explanation better that our first thought is what we’ve been conditioned to think and what we think next defines us. Wouldn’t it be nice if we were conditioned to think the best of others and not the worst. A mentor of mine once advised “Assume best intentions” when wondering about the behavior of another. It’s amazing how that little thought shift can alter your perception of others.